The effort to build a performing arts center in Beaverton inched toward concreteness June 4, as designs by a University of Oregon architecture graduate class helped Beaverton arts advocates see what such a site could look like and provide. City staff and members of the Beaverton Arts Commission, who worked with the class throughout the nine-week quarter, attended the final presentation, where 14 students each presented a design. The city-supported Beaverton Arts Commission is laying the groundwork for a fundraising campaign for a future arts center with a 600-seat theater. A 2011 feasibility study estimated a center would cost $25.5 million, not including the cost of any land purchase. The students could choose between two sites: the vacant 3.7-acre site of the former Westgate Theatre on Southwest Cedar Hills Boulevard, which is owned by the city and Metro, the regional planning agency, and an empty 3.4-acre lot owned by the Biggi Family Trust on Southwest Lombard Avenue, north of the Beaverton Transit Center. Seven students chose to design for each site. However, the students were allowed to expand their designs to neighboring sites. Some designed for properties north of the Round, a long-faltering housing and retail development at the Beaverton Central MAX Station. 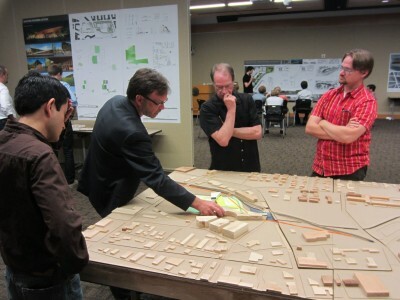 Designing for Beaverton offered challenges, said Joe Baldwin, an associate for Opsis Architecture in Portland and one of the instructors for the class, because the city’s downtown is not well defined. “The hardest part about designing in suburban areas is there are not a lot of clues … about what makes something appropriate to the space,” said Nancy Cheng, Portland program director for the university’s architecture department. “There’s a lot of boldness” in the students’ designs, she said. Beaverton Arts Commission members had told the students that the performing arts center should be an iconic structure that could encourage other development in the city’s downtown. Another student, Charley Danner, included an outdoor projection screen where residents could watch performances or movies for free. “That’s part of using this building, not only as a catalyst for urban growth, but as a catalyst for cultural growth as well,” he said. Student Kendra Hexberg-Fitzwater said she saw the project as an opportunity to help Beaverton urbanize. Hexberg-Fitzwater, 25, lives in Cedar Hills but doesn’t think of downtown Beaverton as a destination, she said. “If there was a theater right next to the Round, I would totally hop the train and go,” she said.